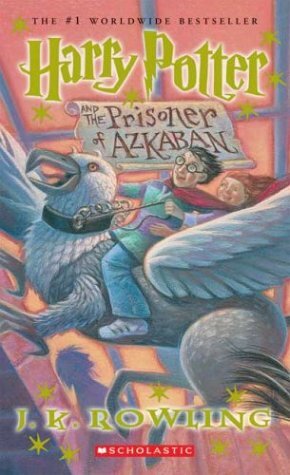 Fresh off The Chamber Of Secrets, my least favorite Harry Potter book, we get to The Prisoner Of Azkaban, my favorite book in the series. And similar to the Chamber Of Secrets, I can't exactly explain why it is my favorite. But I loved it the first time I read it, and I've loved it with every re-read. I've probably re-read this book more than any of the others. Harry is at a good age, no longer a child, but not yet a jaded, angry teenager. The book is more mature than the first two, but doesn't have the same evil and dark tones as do the later books. I especially love the ending of this book. Things change so fast from Harry's murderous rage against Sirius to a mad rush with Hermione to save him, along with Buckbeak. And who wouldn't love to have a time-turner now and then? I also love how the story rolls out so slowly. We gradually learn just who Sirius Black is, why he's after Harry, and just how horrible his presumed betrayal was. The thoughtless betrayal which lead to the murder of James and Lily is a much darker plot arc than we've seen in the prior two books - or at least a more nuanced, mature plot arc. We are also introduced to two of my favorite characters in the series, Lupin and Sirius. It's nice that Hogwarts finally has a decent DADA teacher. Although we really don't learn that much about the Dark Arts from Lupin; rather the kids learn how to defend themselves against dark creatures. Lupin quickly becomes somewhat of a mentor to Harry, teaching him to defend himself from the dementors. Harry has so few adults with whom he really has a strong relationship at this point - really only the Weasleys and Dumbledore - Lupin is a good addition. And of course, Sirius! I love Sirius. He's angry (justifiably), impulsive (rather like Harry), but also fiercely caring and protective. Ironically, Lupin is a good foil to Sirius. Where Sirius is hot-headed and rash, Lupin is calm and mature. It's good for Harry to have both these influences. Lupin has grown up, while Sirius is trapped in his past, forever haunted. Perhaps why I really love this book, is that Harry has moments of true happiness in this book. He wins the Quidditch Cup, for one thing. But on a greater level, he has someone who really loves him for the first time in Sirius. He has someone who wants him. Even as much as the Weasleys care for him, it's not the same thing as a real family member. As his godfather, Sirius is the closest Harry can get to his parents. Plus, he has Lupin, who cares for Harry as much as Sirius. In some ways, Lupin would probably be a better parent to Harry - Harry and Sirius seem to feed off each other's impulsiveness at times. But then again, Sirius can probably understand Harry better than Lupin. 1. Ron gives Harry a sneakoscope (p. 60, UK edition). It won't stop ringing. Ron thinks it's because it's cheap, but in reality, it's because of Scabbers. 2. Mr. Weasley implores Harry before he leaves for school: "Harry, swear to me that you won't go looking for Black." (p. 59, UK edition). Ironic, considering that he doesn't initially go looking for Black but sort of runs into him anyway. And later he and Hermione specifically set out to rescue him. Harry, of course, is completely befuddled by why Mr. Weasley would ask this of him; he has no idea that Sirius supposedly betrayed his parents. 3. Here's an interesting analogy, imperfect thought it may be: Ron : Hermione :: Scabbers : Crookshanks. Obviously, Hermione isn't trying to destroy Ron, like Crookshanks does with Scabbers. But Hermione is a very high-strung, proactive, passionate character. She does everything with vigor, from swearing by the rules to breaking them with impunity when she feels it's called for. Much like Crookshanks, who doesn't hesitate to go after what he wants regardless of what others think, is much smarter than the average cat (even wizard ones, I suspect), and is pretty fearless. Scabbers, aside from being a cowardly murderous animagous, is lazy and weak. Ron isn't exactly any of these characteristics, but he is the type to just let things happen and then complain about them. He is a pretty whiny kid. While he's not stupid, he tends to get by on luck and a continuous sarcastic joke. 4. When Snape looks at Lupin at the opening feast, his expression "was beyond anger: it was loathing...it was the look Snape wore every time he set his eyes on Harry." (p. 72-73, UK edition). This makes sense. Snape seems to forget that Harry isn't James. He hates Lupin almost as much as James. I'm guess he could really care less that Lupin is a werewolf. His hatred for him is based entirely in the memory of being at the bad end of that groups taunting. 5. Chapter 6 is when we first meet Professor Trelawney. She's such an interesting character. Throughout most of this book, she seems like a big fraud. Her one saving grace is her creepy prediction about the imminent escape of Wormtail and rise of Voldemort toward the end of the book. She's forever predicting Harry's death - to the point of ridiculousness. Or is it? Harry is really the only member of the class who will have his life threatened so many times and will face Voldemort alone. Perhaps Trelawney sees more through her bug-eye glasses than even she realizes. 7. Harry's temper is an interesting feature of his character. When Harry learned about Sirius's betrayal of his parents and then looked at Sirius in his photo album, "a hatred such as he had never known before was coursing through Harry like poison." (see p. 158, UK edition). Harry is quick to anger and jump to conclusions in the abstract. But when faced with real situations, such as essentially being able to choose whether Pettigrew lives or dies (see p. 275, UK edition), he acts calmly and isn't ruled by vengeance. 8. Harry produces a patronus that drives away hundreds of dementors. (see p. 300, UK edition). This is really the first sign that we have of Harry becoming a truly skilled wizard. We know that he's just an average student, partially because things don't come easy to him and partially because he doesn't try that hard. As he ages, he goes from being pretty average to having skills far beyond his age. He's starting to hit his stride. I really enjoyed book three - it introduced a lot, but it definitely got darker and started the set-up for Goblet of Fire. This was always my favorite book of the series as well! Yeah, Chamber of Secrets was my least favorite. I really like Prisoner of Azkaban as well. The whole series is just really incredible. Good point about Harry being older but not yet bitter in book three. Ah, how I love Harry Potter! This is my favorite out of all the books! I LOVE Sirius and Lupin and they're my favorite characters (after Ron). I think why I love it so much is because we're told one thing about Sirius all throughout the book and we trust and believe that but when we learn the truth, it's easy to believe and suddenly just like Harry, we know we like Sirius and he's good. I don't know-that moment where I believed with Harry was just such a powerful moment for me as a reader so this book always stands out to me. J.K Rowling has written a series of books reminiscent of works by J.R.R. Tolkien, Madeleine L'Engle, and R.A. Salvatore. I am 25 years old and I was surprised to find Harry Potter and the Chamber of Secrets such an enjoyable read! Rowling's use of words conjures up a highly enjoyable world, where you become quickly attached to the heroes therein. The story is masterfully woven and leaves even the most astute reader looking back several pages to find the clues that they initially paid no attention to. One of the best books I have read in many a year! I still cannot decide which book I like more: the Prisoner of Azkaban or the Goblet of Fire. Those two were definitely my favorites. I loved Sirius and Lupin too. They are just such great characters. I cried when Sirius died!